Description: The mathematical description speakers change the delay of the signal is Designed from flying machine, which is completely described by track record of the change to range before flying machine that adequately describes fluent change the parameter and takes into account its sharp change. Besides, in mathematical description is provided correct restriction of the increase to dispersions to velocities of the change the delay of the signal on time, which depends on type of the flying machine (aerodynamic characteristic) and particularities of its displacement. Ratnikov, I.M. and Fedorovskyi, O.V. 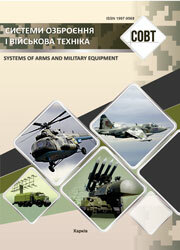 (2011), “Matematychnyi opys dynamiky zminy zatrymky syhnalu pry zmini polozhennia v prostori litalnoho aparatu”, Systems of Arms and Military Equipment, No. 2(26), pp. 166-168.